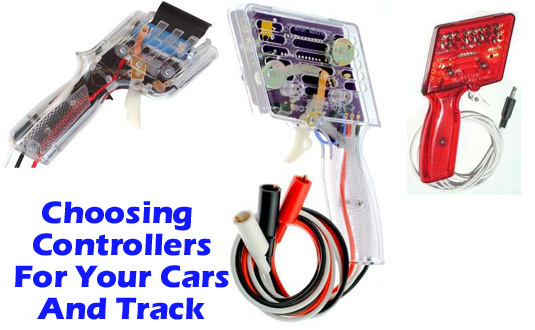 The correct choice of controllers makes a crucial difference in the quality of your slot car racing experience. If your controllers are not properly matched to the requirements of your cars you will not have optimum control and will not be able to turn consistently fast lap times. On all controllers, when the trigger is in the "off" position the circuit to your car is broken and the car receives no power. As you pull back or release the trigger your controller varies the speed of your car by letting a greater or smaller portion of the available track power reach the car's motor. A conventional resistor controller does this by converting a varying portion of the track power to heat. 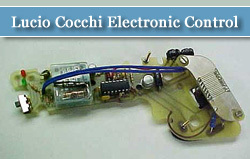 An electronic controller uses advanced circuitry to accomplish the same purpose but without creating nearly as much heat. At full power, when the trigger is pulled all the way back, the controller completes a direct circuit that gives the car all the available track power for maximum acceleration and speed. With resistor controllers, such as those supplied in race sets and the aftermarket controllers made by Parma, the resistance value, measured in ohms, needs to match the demands of the car's motor and magnet combination. The hotter the motor and the more powerful the magnet the more current the motor will draw and the lower the required resistance value for optimum control. If your controller has too little resistance the car will take off at full speed when the trigger is pulled only part way back. If the resistance is too high you will have to pull the trigger part way back before the car moves at all. Either way you have only a portion of the controller trigger's travel over which to vary the speed of the car and you don't have full control. When the controller resistance is perfectly matched to the car's needs you have the full range of trigger travel over which to vary the car's speed. The car will move off from rest at very low speed as soon as the trigger leaves the "off" position and will continue to accelerate until it reaches top speed just as the trigger reaches the full throttle position. If you drive a variety of cars with widely differing resistance requirements you will need several different controllers to cover all of them properly. 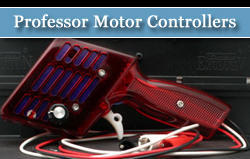 The great advantage of electronic controllers, such as the Professor Motor units, is that a single controller will, within broad limits, allow you to drive cars with differing motor and magnet setups with equal effectiveness. An electronic controller can be equipped with a variable sensitivity adjustment that expands its effective control parameters even more. 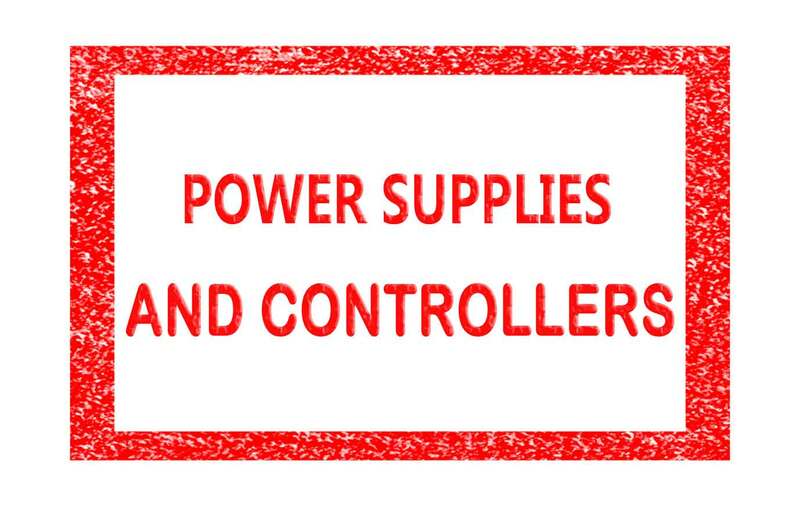 Your choice of controllers is a tradeoff between your driving needs and your budget. The controllers that come in all manufacturers' race sets are designed primarily to be as inexpensive to produce as possible while giving a reasonable degree of control with the set's original cars. Unfortunately, the manufacturers have not kept the resistance values of their controllers in balance with the increased performance of their cars over the last several years, so there is a growing mismatch between cars and controllers in current-production race sets. If you intend your set to be used as anything more than the most casual kind of toy you will want to upgrade to aftermarket controllers. 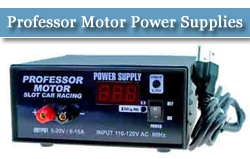 Both Parma and Professor Motor make good-quality controllers in various models that come wired with the necessary plugs for all the currently available track systems, so a controller upgrade is entirely a plug-and-play undertaking. If you intend to run only stock-motor, stock-magnet cars on your track and cost is a major constraint on your choices you can do quite well with a set of Parma "econo" controllers of 25 or 45 ohms. These will not be ideally matched to all your cars but will give generally adequate, if not perfect control to all of them. If your interests in cars run from mild to wild you will definitely want to go with electronic controllers at about $50 on up. One good way to keep the cost of controllers and of car development from being a burden to you and those who race with you is to determine a level of performance and set of driving qualities you all enjoy and set up all your cars accordingly, either upgrading or detuning them as needed to make them all similar in feel and performance. Then select a controller type that works well with your cars and make it the mandatory "spec" controller for your track. 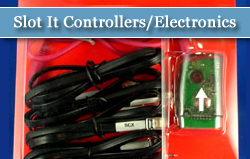 Not only does this ensure that everyone will need only one controller, which can be an inexpensive resistor type if you really want to hold down costs, it automatically places a limit on car performance and cost, since cars that are hopped up beyond the agreed-upon levels will be handicapped by the limitations of the controllers. There is still room to experiment and refine car performance but it will be aimed more at getting the most out of a fairly standard package rather than an expensive "arms race" with ever-hotter motors and more radical magnets. You will also ensure that newcomers who use your "house" controllers until they can get their own will not be at a disadvantage. One further note in choosing controllers: There is a significant subjective factor at work in any controller choice. To drive a given car on a given track and power supply you nay prefer, for instance, a 45-ohm controller while someone else may feel more comfortable and drive just as fast with a 25 or 35-ohm controller. So, don't take anyone else's controller recommendations as anything but a starting point for determining your own preferences by actually trying controllers of different specifications on the track.